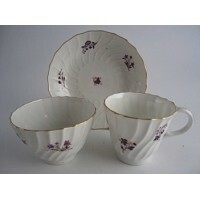 A selection of porcelain tea wares from the famous Coalport factory in Shropshire, founded by John Rose in 1796. 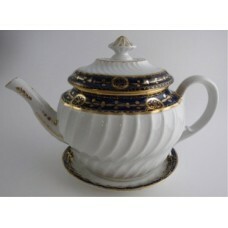 During the 19th century the factory became famous for elaborate porcelain encrusted with delicate flowers, known as 'Coalbrookdale'. 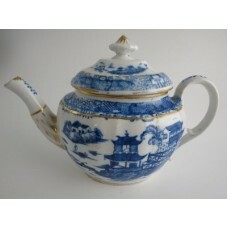 A fine Coalport 'John Rose' oval fluted teapot, decorated in blue and white with Chin..
A very attractive John Rose Coalport teapot and cover c1798. 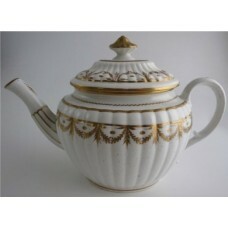 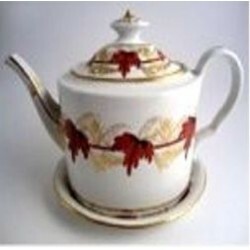 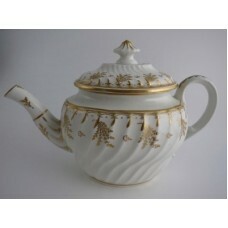 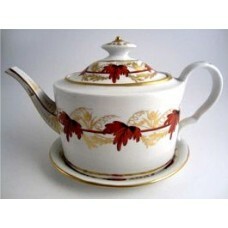 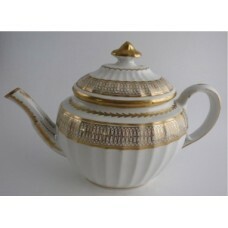 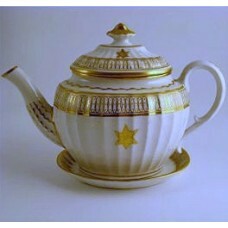 It is elegantly decorated in g..
A very beautiful John Rose Coalport teapot and cover c1798. 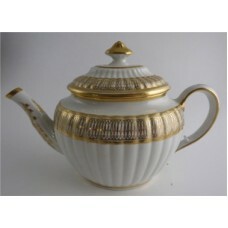 It is elegantly decorated in gilded d..
An elegant John Rose Coalport Teapot and cover of 'new fluted' moulded oval shape and having ..
A rare and very attractive John Rose Coalport oval straight sided teapot c1803, beautifully deco..
An attractive Coalport 'John Rose' teapot in the style of New Hall, c1805. 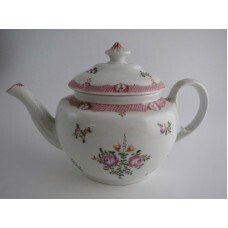 Decorated with the..
A very attractive John Rose Coalport teapot and cover, c1798. 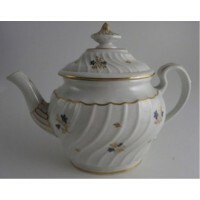 It is of a charming 'waisted' m..
A striking John Rose Coalport teapot and stand of waisted spiral fluted form and beauti..
A handsome oval 'new fluted' design teapot, cover and stand form the Coalport factory, c1810. 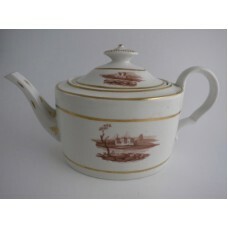 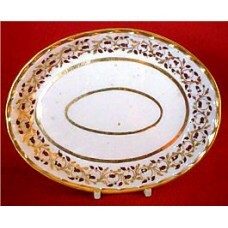 ..
An attractive Coalport teapot and stand of oval straight sided shape, beautifully decorated with a ..
An elegant and very attractive Coalport oval teapot stand of pattern 303, made c1810. 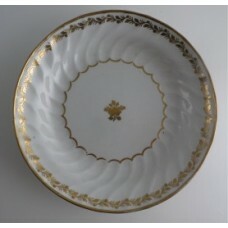 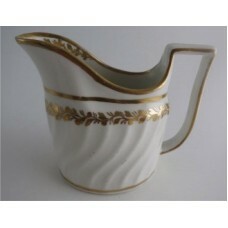 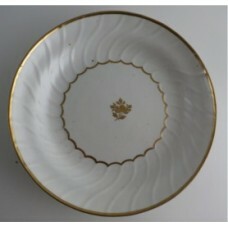 This bea..
Coalport Oval Spiral Shanked Milk Jug, Gilded Leaf Garland Decoration, c1800 A most..
Coalport Spiral Shanked Plate, Gilded Leaf Garland Decoration, c1800 A most ele..
Coalport Spiral Shanked Plate, Gilded Decoration, c1800 A most elegan..
Coalport Spiral Shanked Trio (Tea Bowl, Coffee Can and Saucer), Gilded Leaf Garland Decoration, ..
An elegant 'Flight and Barr' period Worcester Oval Shanked Teapot and Cover, Blue, Pink, Green..
A delightful Worcester trio from the 'Barr' Worcester period, c1795. 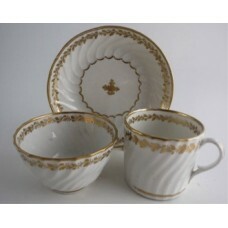 This charming trio com..